Description: Defeat the zombies while managing multiple resources in this strategy game, which is combination between a real time strategy game and a tower defense. 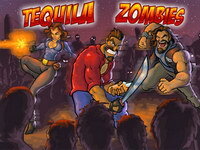 Kill all the zombies and survive! Instructions: The game consists of building towers, managing the resources needed by those towers (and the location of those resources), collecting more resources from cleared out buildings, and using resources to expand and destroy zombies.